Please contact us at info@runkilkee.ie with any questions. Run Kilkee will take place along the spectacular Loop Head Peninsula in Co Clare on Saturday 13th July 2019. The course consists of a 13.1 mile Half Marathon and a 10km run/walk set along the stunning sea cliff panoramic views of the Loop Head Peninsula. This is a 'must do' event in one of Irelands must beautiful locations on the Wild Atlantic Way with the course designed for runners and walkers to enjoy its breathtaking scenery and beautiful rugged coastline. The routes will immerse runners and walkers in the natural beauty of the Loop Head Peninsula on the Wild Atlantic Way. Both the Half Marathon and 10K start and finish in Kilkee Town along the horseshoe bay with a kilometre of golden, blue-flag beach. 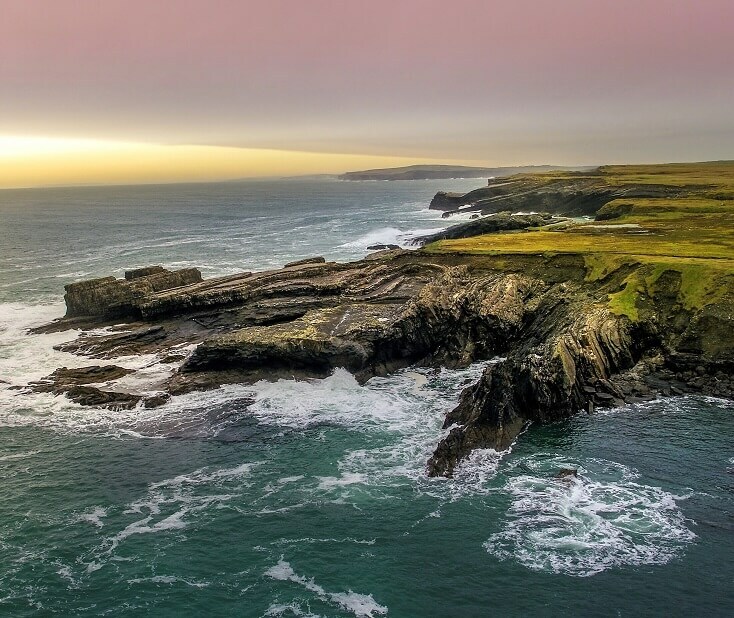 This scenic route, part of the Wild Atlantic Way, takes you on an out and back along the spectacular coastline of Loop Head. You will enjoy some of the most dramatic scenery on the Irish coast. You'll pass dizzying cliffs and improbable seastacks as the drive steers you back to Kilkee. This is just a truly awesome route. On your return to Kilkee there will be a massive welcome awaiting you to celebrate your journey on one on Ireland's most incredible routes. Please click the header below to learn more. Run Kilkee will take place along the spectacular Loop Head Peninsula in Co Clare on Saturday 13th July 2019. The course consists of a 13.1 mile Half Marathon and a 10km run/walk set along the stunning sea cliff panoramic views of the Loop Head Peninsula. This is a 'must do' event in one of Irelands must beautiful locations on the Wild Atlantic Way with the course designed for runners and walkers to enjoy its breathtaking scenery and beautiful rugged coastline.